them part of our community. Check out what we have below! Are you curious about how to repair your flute or piccolo in case of an emergency? school, flute club, flute association or private studio. This repair clinic is widely received as an exceptional opportunity for students, future instructors and future band directors as well as seasoned players and educators to increase their capability for emergency repairs and technical knowledge of flutes and piccolo repair and manufacturing. 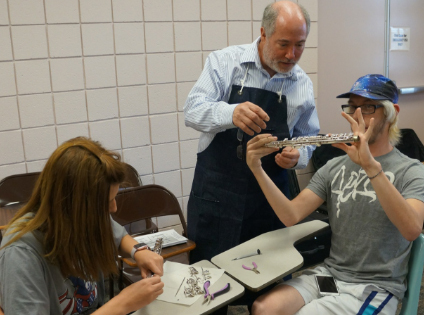 The unique hands-on opportunity will allow flutists of all ages to take a flute apart and reassemble it under the guidance of our clinicians. You do not need to be mechanically-inclined to participate. 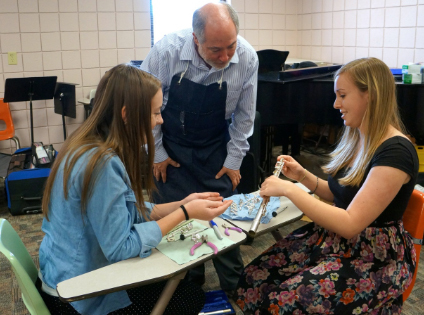 Founder of Flute Specialists, Robert Johnson, has presented this repair clinic across the country, including at two National Flute Association Conferences, a National Suzuki Conference, Universities, and colleges, flute festivals, summer camps, workshops as well as junior high and high schools. We are also available for “house calls“-visiting your community, performing repairs and bringing instruments for testing without us having to give the repair lecture. Contact us to schedule your own presentation for your studio visit. Each of our staff of professional instructions are also available for clinics and sectionals. Private lessons are offered right here in our store. Lessons are the key to success in mastering an instrument. Individual attention gives the student customized instruction on how to play the instrument properly and how to read and interpret the music. Lessons are for individuals who are beginners, students who are struggling, band and orchestra members who are bored and want to play more or harder music, and even adults who want to learn, learn again, or continue learning more. Lessons are typically weekly, and they can be taken long term or short term (i.e. getting ready for solo and ensemble or an audition). give an opportunity for all students to perform as a soloist or with a group.